Grant, we beseech Thee, almighty God, that we who fail through infirmity in our many difficulties, may be relieved through the merits of the passion of Thine only-begotten Son. The Station today is at the church of St. Praxedes which was built over St. Praxedes’ house. It was one of the twenty-five original parishes in Rome. It is easily one of the most beautiful churches in the Eternal City and is bedecked with incredibly beautiful mosaics. The present church is the one built by Pope Adrian I c. 780, completed and altered by Pope St. Paschal I c. 822. It was enlarged at that time mainly to serve as a repository for relics from the catacombs. The Church of St. Praxedes is the church where the precious Pillar of Flagellation was brought from the Holy Land by the Crusaders along with three thorns from the Crown of Thorns. Under Pope Paschalis I many relics of numerous martyrs were brought to this church. Santa Prassede became today’s station during the tenth century after the transfer from Santi Nereo ed Achilleo. In 1198 the church was given to the Benedictine Monks of the Congregation of Vallombrosia, who still direct it. Saint Charles Borromeo (Medici, 1538-1584), who was cardinal titular of this church, celebrated Mass here daily while he was in Rome, and his chair is in the chapel of his name. St. Bridget of Sweden often came here to pray, and the Chapel of the Crucifix contains a crucifix that is said to have spoken to her. Note the porphyry disc in the nave which seals the well of the original house. Be sure to visit “the Garden of Paradise” and the Chapel of St. Zeno with relics of Sts. Zeno and Valentine. 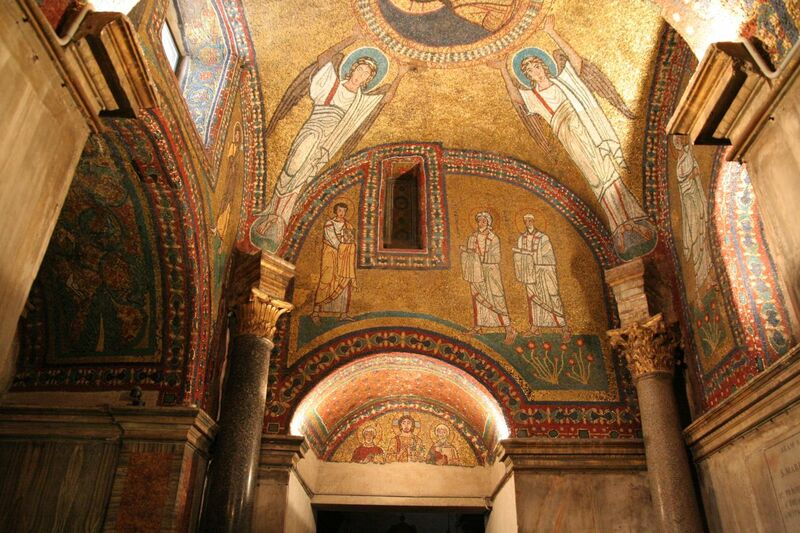 Also in this church is a chapel with half of the Pillar at which Our Lord was scourged and a 9th century Byzantine mosaic depicting the Blessed Virgin and saints on the inner arch and Christ and the Apostles on the outer. The 9th century Byzantine apse mosaic depicts Christ among the clouds being awarded the crown of victory by the hand of the Father. He is flanked by Sts. Peter and Paul, holding their arms around the shoulders of Sts. Prassede and Pudentiana. Pope St. Paschal (with a square halo, indicating that he was still alive at its execution) is seen holding a model of the church, and the saint on the right side is probably St. Zeno the martyr. The blue band at the base is a common symbol of baptism, and here it is even inscribed Jordanes, the River Jordan in which the sacrament of Baptism was instituted. Do not miss the relics of the sponge, in the sarcophagus of Sts. Prassede and Pudentiana, and other relics of the martyrs. Near the main entrance (most visitors enter through the side door) is a marble slab fixed into the wall. It is said that Saint Praxedis once slept on it. A statue of the saint stands in front of the slab. In a chapel on the right-hand side of the nave are vestments and articles of clothing that belonged to Pope St. Pius X.